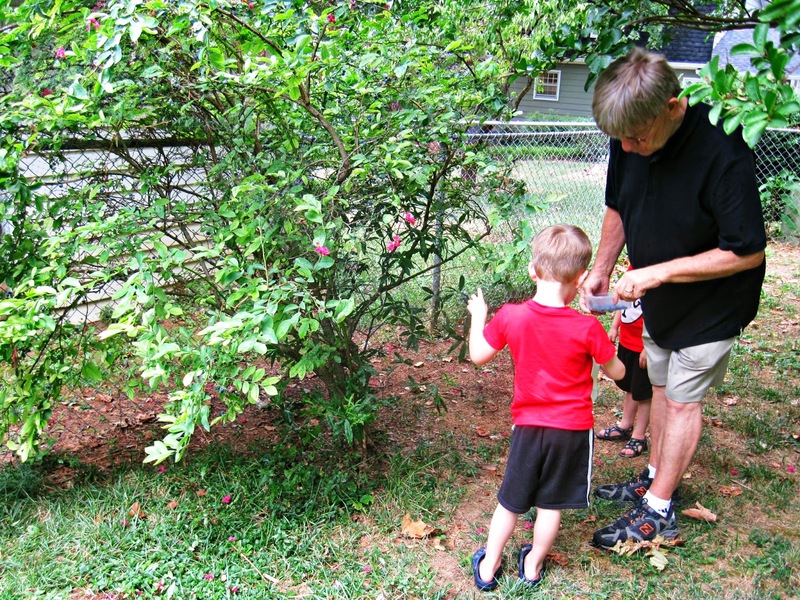 When we visited my aunt and uncle in Greensboro a few weeks ago, their blueberry bushes were in full fruit. I use the term 'bushes' loosely, as they were really the size of trees. These blueberries are extra special though. They were a gift many years ago to my aunt and uncle from my grandfather. He sure would be smiling if he could see his great-grandsons picking those berries. Cort picked a bunch of blueberries. Reid picked a bunch of blueberries. 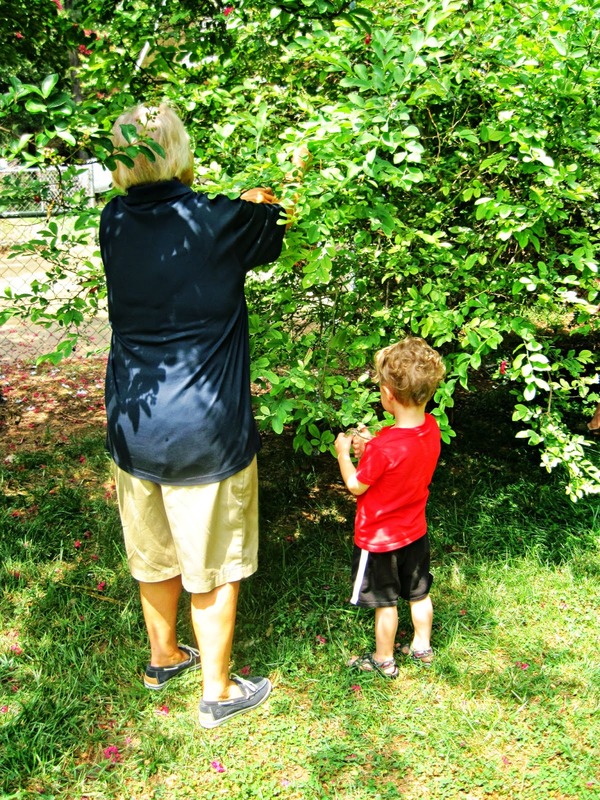 Pam and George picked a bunch of blueberries. And I picked a good number of blueberries. "What about Pierce? ", you ask. Didn't he pick blueberries? Oh Pierce. Quit eating all the blueberries! Readers, have you devoured any berries this summer? We've eaten a ton of raspberries and blueberries this summer! It looks like a great time was had by all, especially Pierce! I have never seen blueberry trees, those must have been planted in just the right place. I will have to look into blue berries. Heerlijk dat is smullen aalbessen ,zwarte bessen kruisbessen het kan niet op. I'm not a blueberry fan but I made my husband a dessert of strawberries, blueberries and raspberries with cream yesterday. He loved it! Looks like you and your boys are having a great Summer. i eat berries every morning before coffee, all year round. sadly, i have to buy mine at the grocer. Lots and lots--no blueberries of our own yet, our bushes are quite young, but we enjoy the ones we bought at the farmers market. Oh, Lisa I'd be right there with Pierce! Yes, your grandfather would be so delighted. We devoured wild raspberries after freezing them. They were GREAT over ice cream. This was definitely a remake of Blueberries for Sal. I do the same thing in a raspberry patch! Didn't Pierce do that with the strawberries too? :-) I love blueberries. I've gotten some at the store. i like putting them on oatmeal in the morning or mixing them with cut-up nectarines. So cool! We have gone to the peach orchard, to two of them actually! That will be an upcoming post for sure. Phil eats a big plate of different berries at night maybe three or four times a a week. We have picked cherries and strawberries with Ella. i love the instagram shot today of your running partner. too kind of him to go along with you. do you ever race? That looks so interesting! We have no berries here, especially blueberry. I have planned to grow lowland strawberry which adaptable on hot weather. A fun and healthy activity for the children. Pierce had the right idea to eat 'em straight off the plant. I've been eating strawberries. Blackberries are my favorite but haven't bought any yet. I've been into watermelon lately. Love the photos. We picked fresh blueberries at a friend's house. They were delicious but it was a hot and tedious job! I picked blueberrys today with my mama. I love blue berrys.. The photos are so adorable! My big dream is to buy a horse farm, and plant some veggies and berries in a Southern State. 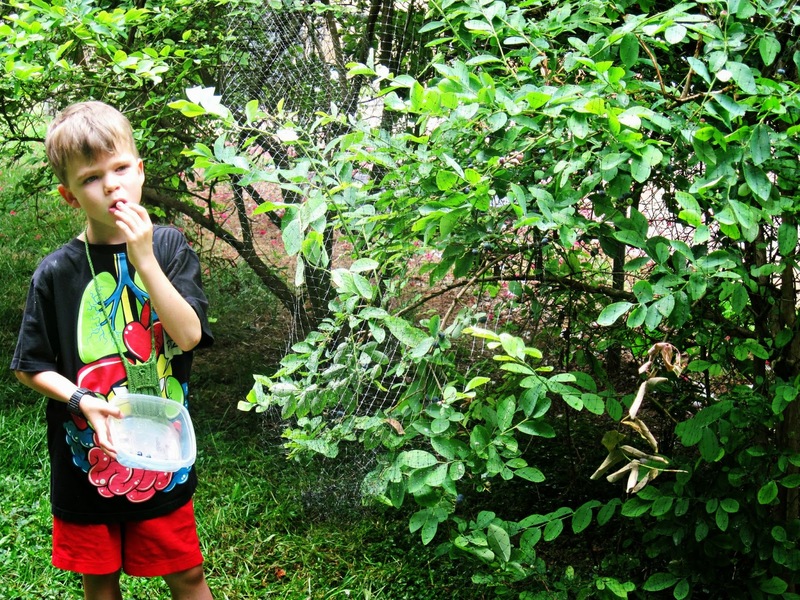 Your children must have had lots of fun in your aunt's house picking out blueberries. Look! Pierce had tasted some. I love your photos, Lisa! Your children look so happy. Have a fantastic week, sweetheart! We went strawberry picking a few weeks back. The blueberries were in season too, but my little guy opted for the strawberries--his favorite. How fun and delicious! We have gone through many carton of blueberries this year. My guys love them. Blueberries are great this time of year. Your little fella is really enjoying them. We haven't even seen blueberries this year. Strange, but true. Now to be prophetic: I see blueberry jam in your future! Great post! We've had strawberries several times this summer. Pierce looks like my kind of berry picker--eat one save one eat one save one. We have not done much picking this year. The cold spring was tough on the local strawberry crop and we have just had too many kid sports and trips to do any other picking. I had to laugh at Pierce's expression: in a reflective mood! He reminds me of a kid down the street, where I grew up, who played baseball with me! I have purchased berries from the grocery, but they are expensive and you get so little for the money. The frozen blueberries at Costco are useful for energy, and I toss a packet in my freezer. I've just finished a casserole full of blueberries, 'cause what else can you do at 4:50 in the morning when you can't sleep?! Sadly no. I used to like berries but now they make my gums sore. Those bushes are really huge! love the history with your blueberries, that's awesome! Oh yes berries are so yummy! Berries are so yummy! Love the photos!